Display ads have become one of today’s biggest trends in Internet advertising with huge potential for growth. MarketingLand.com recently reported on why it’s suddenly the heyday of display. A 2011 Forrester study on interactive marketing spending predicted that search dollars will steadily shift toward display through 2016. This is the result of the high PPC for paid search, which is increasingly driving marketers toward the more efficient and effective option of biddable display media. 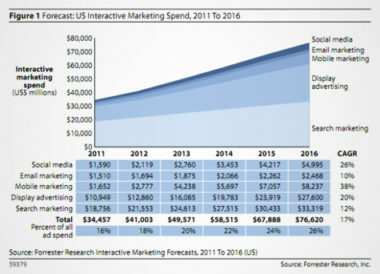 In fact, display advertising is expected to surpass search advertising over the next three years, according to eMarketer. Another indication that display ads are gaining momentum is Google’s surprising decision to start focusing on display ads and mobile search instead of relying so heavily on keyword search. Experts believe that display advertising and mobile search will play a predominant role in Google’s future growth. For marketers still entrenched in search, now is the time to time to start experimenting with display ads, as well as finding ways to integrate their current search strategies with display media. Both can happily co-exist, but marketers shouldn’t miss this opportunity to discover where display ads can lead them. To learn how efficient and effective display media can drive sales, contact MDG Advertising.